They are actually a breakfast food from southern India but we ate them for dinner while in northern India. Thug life. The Dosas we got were huge. They were folded into a triangle shape and the corners stretched off sides of our large plates. Our Dosas were filled with spiced and seasoned potatoes and served with various different chutneys (a spicy condiment made of fruits or vegetables). Like most Indian food, they had a crazy amount of flavor which was accented perfectly with the light, crispy taste and texture of the pancake. 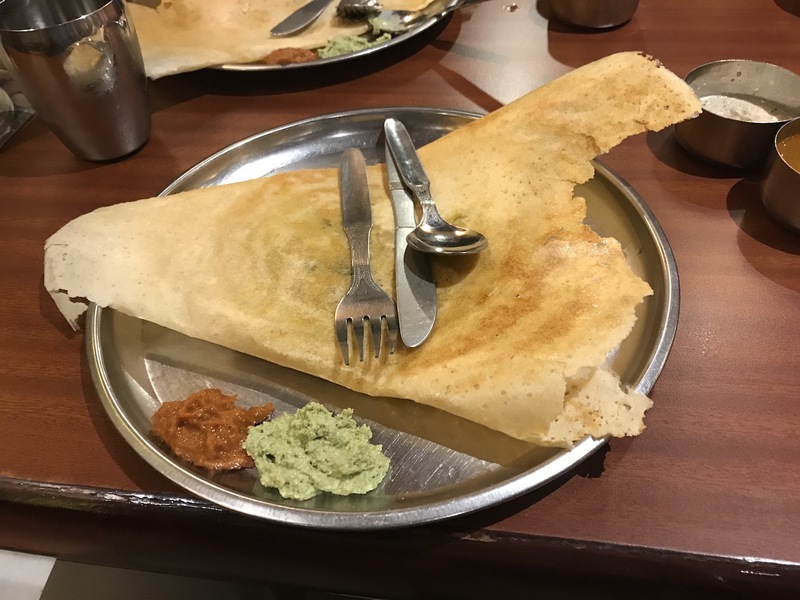 Dosas can be found all over India and are perfect for when you feel like you’ve had too many curry dishes. They also get bonus points for being fast and really cheap. Note: It has been brought to my attention that certain individuals (Gunnar) think that I shouldn’t give every new food a 5/5 score because “it makes it less meaningful”. I would like these individuals (Gunnar) to know that my scoring system is flawless. It is extremely comprehensive and every food is rigorously evaluated on over 100 different criteria. I just happen to pick perfect meals every time. So step off.